The location was just amazing with easy walks to the bus stop and a great beach. The apartment was really comfortable, with super nice terrace and strong shower. The bathrobes were a very nice touch. All the staff were super kind and welcoming, thank you so much! We got free transfers from and to the port. I would definitely come back! It is my first time in Greece, everyday I am touched by the warm people in this country. Here the level of hospitality the hotel owners exhited is even more out of expectation. They picked us up from the port, helped my parents with their luggage, and provided everything we needed. It is an experience that you won't find in any big city. I truly recommend this place from the bottom of my heart! The view is spectacular! There is a little patio in front of each apartment,with the view of the port and sea. The apartment was very clean, everything is nicely decorated, particularly loved the bathrobes. The owners met us at the ferry with the minibus And brought us and our luggage to the place, same on the way back. Everybody is helpful and very nice. Fresh towels and cleaning daily. There are couple of market places close by for food shopping as well as plenty of coffee places and restaurants. Lovely rooms with plenty of space. Well kitted out with kitchen equipment. They even provided bathrobes and slippers!! Super view from the balcony. Daily room service, our towels were changed daily - we went back to a different towel 'sculpture' everyday!! Good access for Livadkia beach. Lovely family - nothing too much trouble. The landlord met us at the port, which made for a smooth journey. The apartment was spacious and clean, with a good size balcony and fantastic views. Very good location with stunning sea view, walking distance from the restaurants and shops in Livadi. Very friendly owners (who live downstairs) and who provided transport to and from the ferry. Daily cleaning incl towels and bed linnen. Nice view and walking distance to Livadakia beach! Spacious, clean and comfortable apartments in typical Cycladic style - all white and blue, built-in beds, perfect view over Livadakia bay. Nice details such as bathrobes and slippers, iron and ironing board. Lock in a great price for Aigaion Studios – rated 9.3 by recent guests! 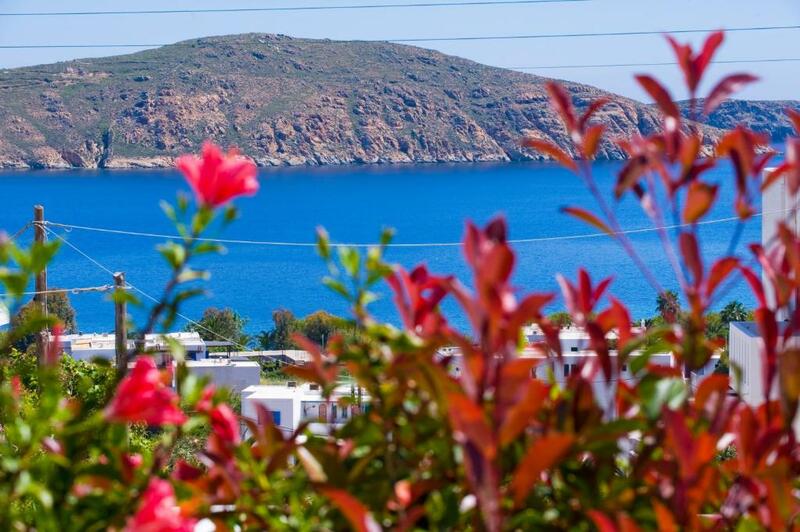 Offering a sun terrace, garden and studios with a balcony overlooking the Aegean Sea, Aigaion Studios is 650 feet from the beach of Livadakia in Serifos. The property is 1,300 feet from restaurants and cafeterias. Each of the air-conditioned apartments features free Wi-Fi and a TV. The kitchenette includes a fridge, electric kettle and coffee machine. The bathroom comes with a shower, hairdryer and free toiletries. Aigaion Studios is 1.9 mi from Chora, with its castle ruins and the Archaeological and Folklore Museums. The port is 1,650 feet away. When would you like to stay at Aigaion Studios? Offering a balcony overlooking the Aegean Sea, the air-conditioned apartment includes free Wi-Fi and a TV. The kitchenette features a fridge, electric kettle and coffee machine. The bathroom comes with a shower, hairdryer and free toiletries. House Rules Aigaion Studios takes special requests – add in the next step! In case you wish to use the free port transfer, please notify Aigaion Studios 1 day in advance. The kitchen was equipped OK but could have been better. No salt or oil and only one frying pan of bad quality. It would be quite difficult to make dinner (something more sophisticated than just a salad). The wifi reception needs to be sorted. The view from the apartment is breathtaking. There is a bit of walk from port and shops but it is well worth it for view and overall quality of the place! The usual shower curtain saga!! The curtain was perfectly clean but because the shower trays are on the small side it's difficult to shower without becoming entangled in the curtain. I know some of the apartments at the Aigaion have shower screens (very posh for Greece!!) but that creates a different problem as space is then restricted by something solid. The choice is bruised elbows or a fight with the curtain. This however is typical of all Greece and for me part of the fun!! Wifi was poor (mostly no access) and the matrass could be better. But for the price of the room and the quality service all-over this is forgiven. View and location are excellent, but you need to be seriously fit to feel comfortable in Aigaion, especially when staying on the upper floors. It's a bit of a climb from port, beach and restaurants (15 minutes uphill), and again from the entrance - to get to your room by stairs. Perfect location, most friendly and helpful the owner ever. Excellent experience.